With today’s fast paced life style many people are very much tuned into eating healthy. But who has time for it? A plate of salmon and steamed vegetables sounds delicious but fried food takes less than 30 minutes to prepare from start to finish. If you are one of those people looking for fast and healthy way to cook look no further than steam oven. Even though they have been around since the 70’s, steam ovens recently started getting all the acknowledgments and credits they deserve. 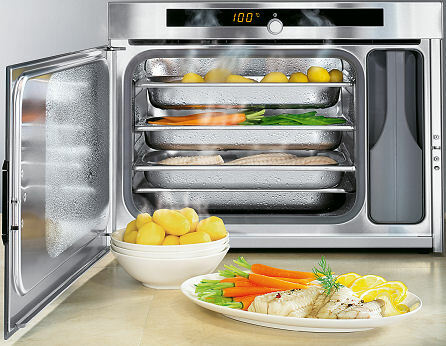 Using water from a built-in reservoir to produce hot steam inside the oven chamber, these ovens are perfect for cooking anything from vegetables to fish and lean meats without compromising the flavor of food. Food cooked in steam oven requires less or no usage of supplementary oils to keep it moist and preserves all of its natural vitamins and nutrients which are important for human diet. Another benefit to owning a steam oven is less time spent for cooking. A wholesome meal can be cooked in less than an hour which makes this kitchen appliance an efficient energy saver. Also, different types of food can be cooked at the same time without transfer of smell and flavor. This not only mean that a whole meal can be cooked in less time but also less pots and cooking trays to clean. Easy-to-clean benefit applies to cleaning steam oven itself as well. Usually, the interior just needs to be wiped with hot soapy water and for that stubborn soiling, steam oven offers a cleaning functions. In addition to self-cleaning, steam oven features numerous cooking functions such as: full steam cooking, low temperature cooking, defrosting, grilling and convectional cooking allowing easy, fast and healthy cooking. Then why are many people still conservative to steam ovens? Maybe because of the price tag they come with? Many manufacturers offer small sized steam ovens that can easily fit on any counter top. They still have all the features and benefits at more affordable price. Therefore, owning a steam oven is a very good home investment in a long-run.